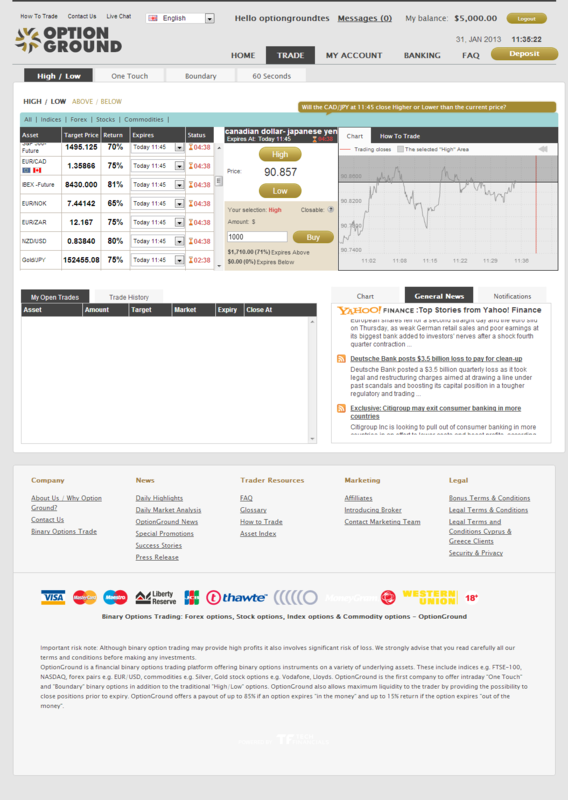 Option Ground is a high-end binary options platform offering users “best in industry” usability and choice. The company is hyper client focused, delivering customer satisfaction through every step in the trading process. The company’s tagline is “building your wealth on solid ground”, and their platform certainly provides the base on which to achieve ambitious wealth development goals. Sign up to Option Ground and get your Welcome Bonus of up to 75%! Option ground offer a three-tiered bonus system based. Experienced traders understand the necessity of having a solid financial basis on which to trade. These bonuses afford new traders the ability to increase their financial trading account and facilitate more rapid goal achievement. New traders receive a bronze welcome bonus of 30% on deposits of $200-$999, a sliver bonus of 50% on $1000-$4999 and a massive gold level bonus of 75% on deposits of $5000-$9999. These great offers provide great impetus to drive your trading career forward. Option Ground is a great choice for traders at all stages of their binary options careers. Clients can get going with a minimum deposit of just $200. Minimum trades vary based on the trade type chosen. 60-second binaries can be traded with $5, put and call trades with $25 and one touch trades with $50. The platform is available in English, with more languages to be added soon. Traders can choose to engage with their trades in Euros, GBP or USD. Signing up is fast and easy so traders can get going in minutes. Option Ground is committed to providing constant innovation and enhancement of their platform. Key to their success is the trading experience, making for a smooth and enjoyable flow throw each trade. Traders can seamlessly initiate trades and navigate the platform in order to implement their tactics and achieve their financial goals. Users of the platform can benefit from multiple deposit methods. They can choose from credit card, Western Union and Moneybookers. There are plans to further expand these options in the near future. The expert technologists delivering the Option Ground trading platform are constantly striving to enhance the user experience. New functionality, options, assets and technological rollouts are always round the corner. Traders can choose a trade to suit their strategy and research preferences. Option Ground clients can opt for PUT trades, CALL trades, Touch trades and No Touch trades. Those looking for short timeframes can go for Option Ground 60-second binaries. These have a low minimum trade of just $5 and are over just a minute from trade commencement. It is even possible to trade several 60-second trades concurrently. Profits on Option Ground are at excellent ratios. Standard binaries are up to 81%. For those seeking a more convicted position it is possible to return up to 500% on one touch weekly trades. These high yield trades are an excellent way to gain massive returns on ones investment capital. A terrific team of administrative, trading, technology and customer service staff expertly deliver the Option Ground services. The customer care teams are available 6 days a week, 24 hours a day. They will not provide canned or scripted responses. They will get to the heart of your questions and queries and provide you with the information that you need. If they are unsure they will tell you and find the answers. Customer service is delivered through email, Skype and by phone. Any business is only as good as the feedback that it receives; Option Ground operates an “open for communication” policy for feedback, comments and suggestions. OptionGround is a leading binary options broker and trading platform. OptionGround provides several different assets to choose from. These help you make the best choice from commodities, currencies, and stocks. Owned by Simple Trade since 2008, OptionGround is certainly among the most reliable binary broker and trading platforms available today. OptionGround provides excellent bonuses to help every trader can take advantage of a higher payout. The bonus itself cannot be withdrawn until you have reached a certain trading volume but you can withdraw your money at any time you like. OptionGround brokers work in a very professional way and provide all the necessary training to their traders. Option Ground is a professional, efficient and secure binary options broker platform. They are committed to helping their trading community develop their knowledge and skills through the provision of education, guidance and even coaching. With a fantastic user-friendly experience, some of the best bonuses in the industry, and constant innovation and improvement Option Ground are set to be a leading light in the binary options market. Whether you are a beginner or expert Option Ground provides the tools to have a functional and profitable trading experience. Sign up to OptionGround and get your Welcome Bonus of up to 75%!